Unless your system is demonstrably carbon deficient (rate limited), you'd do well to not add more... IF you need more, easiest and best to add by way of feedings... There ARE downsides to having too much carbon in solution. hey bob. I have spent the better part of 6 months reading about various methods of carbon dosing. with my size tank and bioload, asking a pellet reactor to keep up was not feasible. <Mmm; am guessing "something else" is rate limiting/limited here. I ask that you "open your mind" to not-too endless possibilities; ala Chem. 101A! So I come to you, in recognizing your vast biology and chemistry background. I have read dozens of posts on wwm, reef central, the reef tank etc, and have yet to find any conclusive info regarding the mechanics of carbon dosing. For instance, there are guides on respect to dosing vinegar or vodka, but most of these are made in respect to reef tanks with mild nutrient accumulation. Nothing states usage with a fowlr. Being instant ocean salt just went up 10 dollars at the retail level this year. Bigger water changes are becoming a non possibility for nitrate export. I have failed with the pellets. And now wish to solve it via carbon. therefore I will have an idea of which way to go for dosing. Can I stay there, and eventually the benthic nitrifying bacteria will catch up to out compete the bloom? Or is the other way, where while a persistent bloom will out compete the "good" bacteria, and there prohibit their growth? Is there a balance? Any supplemental reading or Info on the mechanics of bacterial blooms would be greatly helpful and appreciated. I also have my uv off, thinking that was necessary to allow bacteria to grow, however had I have left it on, I am sure I would never know if a bloom was set to spawn or not. I am turning my tank over about 40 times per hour, and have power head positioned at the top to crest better gas exchange. If lack of 02 is the only concern with a bloom, I think I have that basis covered. Hello! First off, thank you for the great information available on your website. It has been a great help to me so many times! Now for my question: I run a biopellet reactor on my reef aquarium. I have often read that you should position the reactor so that the reactor outflow immediately gets pulled into the protein skimmer so as to remove the majority of the bacteria being flushed from the reactor. That's the way I have things set up. However I have been wondering, since the majority of non-photosynthetic sponges feed on dissolved organic matter (DOM) and bacteria, could a biopellet reactor be a good source of food for sponges? Perhaps by placing the reactor at the opposite end of the tank from the skimmer. Or might these be the "wrong" type of bacteria for sponges? What do you think? I would love to keep more colorful sponges but have avoided adding them (except for the ones coming in on live rock) because of care and feeding concerns. <Worth trying moving the reactor; perhaps looking into how you might measure carbon, bacteria here. I have a small two part question I felt was short enough to condense into one email. On second thought, I will make it two emails to make it easier. Firstly, around two months ago I enacted a biopellet reactor using Warner marine pellets. They seem to be doing there job, bringing my nitrates from around 100 to about 40. However in the past week, half of them are clumping together at the top of the reactor. Even when I shut pump off to let them fall, they remain stuck at top. Almost like there's a slime or growth gluing them together. I have tried reaching out to Jon at Warner marine, but the phone has been offline. I know in the beginning he said less flow is better, however I am not sure what is causing them to clump. Would your first inclination tell you to crank up flow, clean pellets out, leave it be? I've looked around on the boards for a week or so, and most advice is given with other types of pellets. Understood. I will leave them be for now, as they seem to be doing there part , and my skimmer is working overtime. One thing I do not like, and com not figure out is water clarity. If I turn my uv light off (25 watt, 400 gph flow on 150 tank) even for a few hours, my water fogs up and visibility goes to nothing. It's been a while since I've written you, and sadly today it's not with great news. I've now lost two fish to something that is baffling me, and I'm really hoping someone on your end can offer me advice. 275 gallon display, 375 gallon total volume 2 year old SPS reef. Until a couple of weeks ago, the tank was home to a doliatus rabbit, 2 Banggai cardinals, 5 dispar Anthias, 3 purple queen Anthias, a powder blue tang, a Suisse (Swiss?) Basslet, a long horn cowfish, a Richmond's Wrasse, and a copper band butterfly. The last fish addition to the tank was the Richmond's wrasse, I think in May or June of last year. Every fish in the tank went through a rigorous tank transfer protocol before being quarantined with PraziPro prior to going in the display. There has been no sign of any kind of disease or parasite up until now. and in February many thousands of dollars worth of SPS coral started to die. I'm still to this day not sure exactly what happened, or how or if the biopellets (which had been on the system since it was established) contributed, but after taking the pellets offline completely and many hundreds of gallons of water changes, including a near 100% water change, the cycle of damage to my corals finally stopped in late May and has now begun to reverse. In all that time, the only water parameters that got out of what would be considered 'normal' range were my alkalinity, and very, very briefly during the worst of the coral losses, a single (i.e. one day) ammonia reading of about 2ppm. Since removing the pellets, my nitrates have climbed to about 5ppm and stabilized on their own. 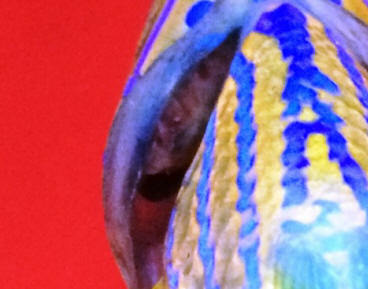 While the was going on, my copper band butterfly developed what looked to me like a tumour under one of it's gill flaps. I'm attaching the best pic I was able to capture. It prevented the one gill from closing completely, but nothing about the fish's behaviour changed. It was still active, fat, hungry, etc. etc. This mass seemed to change size at random over the course of several months, but I got no response from anyone on the Canadian reef forum or Reef Central when I posted pictures, and I couldn't find anything like it online. Anyway, it had that mass for 4 months, then suddenly 2 weeks ago it died. It was behaving normally, ate it's a normal amount of Mysis, brine, and chopped clam during it's evening meal, and was floating by 7am the next morning. I had hoped it was an isolated incident, and that maybe he had just developed gill cancer or something, but last week I noticed my Richmond's wrasse had started refusing food and had lost a bit of weight. Upon closer inspection I discovered a similar looking mass in one of it's gills, and for the past week he's not eaten, and has kind of listlessly swam about the aquarium with what I would describe as the "thousand yard stare". More Googling lead me to suspect gill flukes, and as per a large body of online advice I decided to give it a fresh water dip, both to attempt to confirm flukes by observing them fall off, and to give it some relief if that's what it is. I was absolutely precise in matching the temperature and pH of the dip water to my tank, and I only left the wrasse in the dip for 90 seconds as the fish went in to extreme distress, but it was too much for it. Nothing detached, or obviously came off the fish during the dip. I had hoped it would recover, but after an hour of being blown around in my tank's current upside down having what appeared to be seizures, I anaesthetized it in a bucket with clove oil (the only fish anesthetic easily available to a hobbyist in Canada). This allowed me to get much closer photos than I got with the Butterfly, which had already lost most of it's gills to bristleworms by the time I found it's body. I'm pretty gutted as I feel like I'm now directly responsible, but I don't know what else I could have done. If I had left it in the tank it probably would have died just like the butterfly. Anyway do you guys have any idea as to what this is? or if I should expect similar losses in my other fish. My long horn cowfish has grown from less than 1 inch to nearly a foot long in the past year, and I've arranged for a fellow reefer with a much larger tank to take him, but with two unexplained deaths with nearly identical growths... I feel like I can't share fish until I know what's happening. Thanks, and sorry for the very long e-mail. I'm pretty bummed over this. 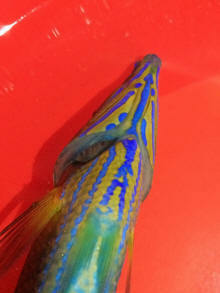 PS, I will keep the Richmond's wrasse's body in the fridge overnight in case you guys need more images. I'm hesitant to dissect it, but if you have something specific I should be looking for I can do that. I also have a reasonably good quality microscope if you think there's something I should look at. For the past month or so, I’ve been cleaning my aquarium glass daily due to a pale whitish film that keeps appearing. I tested for nitrates and phosphates and both came up as undetectable, which is fluent with previous tests. Also; I don’t have any nuisance algae on the glass or the rocks / substrate & have a very small bio load. The tank is a 300 gallon reef ( large pieces of live rock ) and an 80 gallon sump which houses the skimmer / filtration / UV and two bio pellet reactors. I went for two small reactors because I wasn’t able to get the larger reactors in Thailand. Do you think the film is being caused by the bio pellets? I also have been suffering from dusty water for what seems an eternity - could they both be linked? Hi, I have been running bio pellets(in a reactor) as a nitrate reduction systems, I have a second reactor with gfo. I still struggle with small amounts of hair algae. I have recently read some literature that suggests doing vodka dosing instead of bio pellets. Do you guys have a preference or recommendation for nitrate control? how are you? I hope all is fine with you . I have a very important question: what is wrong with my system? Let me explain: my 250 gallon display was set-up 1 year ago. 220 cm long, 70 cm wide and 70 cm high. Sump, AquaMedic aCone 3.0 skimmer rated to 3000 litres, biopellets reactor, antiphos reactor, active carbon reactor running 24h. Ozone , full line apex Neptune system computer with the following readings: ORP 350-390, pH 7.9-8.1 , temp 25.5-26.5 and salinity 34.5-35.0. Calcium reactor, kH 7.2-8.0 , Ca 420-450, Mg 1280-1300. 4-5 months ago I started introducing SPS corals. I always knew I wanted a SPS dominated tank with these beautiful fishes I already have ( only one P. Diacanthus is missing but I will get there also..) then the problems started. I discovered that I had high nitrates: about 20 on Salifert test so I started the maintenance program: got rid of the 2-3 cm sand in the DT because of the wrong depth, siphoning of the sump, changing the media in the reactors etc. I bought some more corals, some Acropora, some more Montiporas, Stylophora.. Because of a faulty salimeter ( the paper with the scale moved inside the glass ) the salinity went to 43 and lots of corals died or dying . I slowly went back. After that, in September I drilled my pavement and installed a 300 l refugium with 18 cm sand bed and Chaetomorpha in the basement with reverse light schedule. After 3 weeks I installed another 200 l tank there with live rock. At the beginning I had some problems with keeping levels of water ( maybe you remember our discussions ) so the salinity varied 1-1.5 points daily for some weeks. Before installing the calcium reactor I had some variations in the levels of kH and Ca. , 1 month ago. After that I thought everything was stable, so I introduced some more corals. But I kept losing some of them. Apparently lots of Montiporas digitata died and also some Acroporas. In November, after the last addition on sand in the RDSB and some more live rock the Cyano started. I had to leave for one week and when I come back more SPS were lost due to Cyano this time ( even thou my friend was at my house every day feeding and cleaning the Cyano). So when I come back I reduced the lighting for the T5 ( I have an AquaMedic 3x250 w CoralVue ReefLux 14000 K plus 4 T5 x 80 w ATI 2 white 2 blue ) turning them off . ( they were on 12 hours ON ) . I only kept the MH. The Cyano receded , every day I clean it and blast with a 1200 l/h pump every rock and coral. But it continues to grow on some corals killing them. I fragged some of the Acropora and the frags until now seem to be doing fine . But every day I discover that another SPS coral is declining. About the lights: after turning down the 4 T5 I have seen lost in coloration also in otherwise hardy corals : Montipora plates , so I have turned them on again and I have measured the PAR readings : bottom 150 -100 between bulbs, middle 230 and top 400. Under the bulbs 1100 micromoles/m2/second. . But before turning on again the T 5 (2 days ago ) the readings with only the MH were seriously lower ( 40-60 bottom between bulbs ). In the meantime I have lost some Acropora that was with me for 10 months and survived all that. But there are some Montiporas and some a Acroporas frags that appear to be doing great so far. I have colonies of Stylophora and Porites that are ok. So, why am I loosing SPS corals? Is the stability of the system? All the changes I have done? Is there something wrong in the water even if I get all these " normal " readings? and the willingness that I feel I am starting to question. I feed the fish 4 times a day ( defrost and rinsed Mysis and krill and bloodworms, spectrum pellets, Nori and Spirulina and 2 big fresh clams ( I think this is the term, the black shells) that I keep in my hands until everything is eaten. All the fish eat a lot and they are fat. But I arrived in one point when I look away from the DT when I pass by, just to avoid seeing sick corals . It was not easy at all, all my friends consider me strange at least do all this for a reef tank, even if they like it when they come by. Keep in mind that I live in eastern Europe where LFS are far away and don't stock livestock, and for example a A. Japonicus costs 250 $. For me, having a SPS tank would mean that all that I have done is worth it, but something is wrong, and I am not sure what it is. My wife is supportive, but I would really want to see some results . So in conclusion I feel that I have done a lot of efforts and at the moment I cannot see the results, so it seems it is very difficult, but I see a lot of successful tanks done with maybe less efforts and I am wondering what am I missing. my plan was that when the nitrates would arrive to zero I would stop the biopellets . About the nitrates, increasing the feeding sounds great, but aren't they the ones that fuel the Cyano? Shouldn't the desired levels be zero absolutely? maybe I should feed more amino acids and vitamins ( I do it like once every 10 days half the dosage ). Thank you. The biopellets are off.. will see what happens. I took the biological route for sure, with the refugium and live rock tank. What about all the beautiful tanks in several ' tank of the month ' editions that report zero NO3 and PO4 ? Normally you don't see any outstanding SPS tank presented that has any detectable nutrients. I think this is very important. Lots of people out there would benefit from understanding these basic philosophies. Please consider that I want nothing less than the most beautiful SPS tank with colors and corals health. I am willing to invest time, energy, and money. What would you recommend as optimal values for NO3 and PO4? And after my system description do you think I would need anything else as hardware or technique? One more question: I run ozone on my skimmer and have a 350 -380 ORP reading. What do you think about these values? On the 25th October 2013, an article dealing with �environmental risks caused by the unintended flushing-out of MBBR (Moving Bed Bio Reactor) carrier media out of wastewater treatment plants� has been published in the 43rd issue of the German industrial magazine �VDI nachrichten�. These carrier mostly consist of synthetic material and are used for the biological waste and wastewater treatment as well as for the water purification in the aquaculture. From our point of view, the environmental and health-related compatibility of synthetic biofilm carrier is an exceedingly relevant topic since these carrier are in a purpose-related connection with the natural water cycle as well as with the human food chain. We were concerned with the topic �Environmental and health risks caused by plasticizers in MBBR media� and drafted a corresponding article (please see attachment). If you should be interested in publishing the attached article on your website, we shall be glad to provide you with our press release in an editable format. We would appreciate it getting a positive reply and we are looking forward to hearing from you. I have a 57 rimless saltwater aquarium. I have a 20 gal sump refugium with macro, a reef octopus 110 skimmer. Would a PhosBan reactor with biopellets do good for my system?? 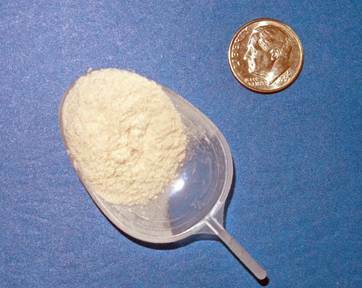 Can you recommend a readily available source of simple/hexose sugar for dosing? My reading shows fruits and honey; I am assuming this is not something I want to add to my aquarium water. I see comments on your site where sugar is discussed in line with Vodka (for carbon dosing); but, from what I understand the sugar must come from an additional source. What do you recommend? Have you guys ever experimented with using table sugar or vodka to lower levels of phosphate and nitrates? I was on a couple of blog sites and they were discussing this. Apparently the Germans are doing this. I don't know what nationality has to do with anything, but since the Germans are doing this, this seems like a good thing or a well kept secret. <Mmm, search on WWM w/ the combination of ingredient and nutrient words. Thanks Bob. I will do so. Unfortunately I wrote you guys after I had added some table sugar. The pH dropped from 8.4 to 7.6 or there about. I corrected it and left for a couple of days and came back to find an Acropora that succumbed to RTN. The pH is still fine, the dKH was around 12.0. Ammonia and nitrite at 0. Nitrate was around 5.0 ppm. Well anyways I'm finished with trying to keep SPS in a small system. Any other coral does fine. I'd like to start carbon dosing, to see if I can reduce the water change volume/frequency in managing my nitrates. Through many threads I've had with you and my review of WWM articles, I've "baked" into my regimen/system natural nitrate reduction techniques but still battle high nitrates, which fuels a recurrent Cyanobacteria bloom. I have a moderately stocked (messy) predator tank, however I also have a 400G rated skimmer (ASM G4 at the moment), an 180G rated upflow algae scrubber, and a 6" DSB in my sump. I use Lanthanum dosing to fight phosphate (i.e., dropping it from steady .2 levels at the moment to .03, although difficult to "stay in front of"). I do water changes from weekly to biweekly, 25% to 50% volume. My nitrates hover between 20 and 50. Within the last week, I decided to try vinegar dosing as an experiment. I dosed about 15mL/day for several days, but stopped when I saw what I believed could be a cloudy bacterial bloom (or could it be haze from the heavy Cyano in the tank?). 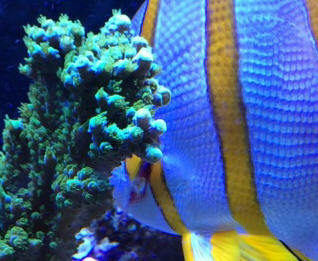 As I understand most of the carbon dosing fundamentals per WWM, and see virtually all guidance on carbon dosing presented in relation to reef tanks (versus fish only), I'm curious to know if you suggest or prefer a particular approach to FOWLR carbon dosing - product? vinegar? vodka? sugar? biopellet? Bob, very helpful, thank you. One last question, again for a FOWLR in the hundreds of gallons. Aside from price difference, were it you, would you select pellets over a sulfur denitrator? OK Bob, will do, thank you. I should have all I need for my DIY reactor build, and expect to have the biopellets online in the next few days. Bob, thanks. Perhaps I should instead dose vodka or sugar temporarily? I know your answer applies to all of the above, but do you think the benefit of any of these carbon delivery methods would apply to my system? IDEAL: The INS100 is ideal for "SPS" aquarium systems with a total capacity of +/- 80 gallons with a heavy bio-load. "SPS" systems (aquaria with a focus on Small Polyped Stony corals) benefit from a high rate of organic extraction as it promotes and enhances coloration in corals by limiting the nutrients available to the symbiotic algae Zooxanthellae) living within there tissue. In addition, a high rate of organic and particulate extraction increases the clarity of the water which in turn enhances the penetration of UV rays that stimulate the development of the corals colorful UV protective materials. Increased water clarity also optimizes the efficiency of the Zooxanthellae a thus decreases the number of the protozoa required to provide the coral with the food (glucose) it takes up in exchange for the CO2 produced by the coral through normal biological processes. Please tell me if I am reading this correctly. So basically if I have a high DOC this will prevent the Zooxanthellae from doing their job and in the end providing the UV material which produces the colors. I believe I have a high amount of DOC since whenever I clean the pads under the incoming water from the tank (in the refugium) they are usually dark brown within a couple of days. I do get a brown film (diatoms) on the sand and glass in the main tank but not in the refugium. Could this be the reason my corals are fading? I have tested for Nitrates and they are at 0. Is there another way to measure DOC? Also in my research for measuring DOC on WWM I see where Xenia thrive on DOC...my tank is stuffed with Xenia. I can't kill it. I have to give it to the LFS so it doesn't over run my tank. In the spirit of full disclosure I have written to WWM on the corals fading to which Mr. Fenner replied to maintain a proper amount of phosphate and nitrates which I have been trying to increase. Also for lighting I use T5s (5 AquaSun and 1 Actinic). I am terribly sorry this email is so long. Thank you Mr. Fenner. I think I will upgrade the skimmer and will change out the filter media daily. Thanks again Mr. Fenner! The carbon dosing article is also schedule to appear in the next issue of CMA. If you wish, you can place this on WWM as well. I believe we are weak in this subject at present. Thank you Bob. Yes, I have approval from all to use their photos. Would you like me to forward their emails to you? Second time asking a question, again after spending hours trying to find the answer. I have a 100g reef tank, approx 80-100lbs live rock, medium coral load, with 11 medium sized fish. I changed my filtration method from refuge with bio-pellets to sump with bag filters and bio-pellets. The reason for the change was to try and get a better handle on my never-ending battle with Aiptasia and hair algae. (I brought in some pics to my LFS and the look of horror said enough). Most of my corals are happy but some are being choked out or irritated by the hair algae. nitrates were high before the bio-pellets but have stayed in check since. so I am wondering if this same food is feeding my Aiptasia and hair algae as well? <<I would think not, though who knows what may be introduced as byproducts of the manufacturing process of the pellets. And if the claims are accurate…this bacterial food element should be “competing for the same foods” (DOCs) as the nuisance organisms you list (FYI – Aiptasia are very good absorption feeders too). and pull cupfuls of algae out weekly. As always, thank you for the help and the info on the site! I unfortunately tried the usual band of cleaners and herbivores with little success; hermits, Mithrax, hares, Copperbands, etc., etc., etc. They all seem to either avoid the buffet or disappear never to be seen again. I forgot to mention I have Coralife 125g skimmer which when it's not being finicky produces about half a gallon of skimmate per day. I am going to try the raised magnesium idea next, seems like a lot of folks with good results. The only idea next is cooking the live rock, but the LFS tends to believe the rock I have may not be able to be rid of phosphates to low enough levels (the rock is Caribbean that was used previously in a fresh water setup with a few years spent as landscaping in between). Ran the review by Lou to be sure any statement I made was correct. Below is his reply and the article is attached for you to review. Last time I talked to Neale he mentioned that he didn't want any new articles sent to him until he is ready to do the next issue. I'll contact him and get a date I can send this to him. May want to post on our site beforehand?? That all seems correct and very positive. I really appreciate it as this is a product that has taken off in a very big way in Europe and is largely unknown here in the states. Whenever carbon dosing is mentioned in anything, it is usually left out as people don't get what it is. Thank you so much for taking the time to understand the product and try it. Thanks again and as always let me know if there is ever anything other info you need or questions to be answered. Actually there isn't much to compare it to other than the few bio-polymer products available. Both Reef Actif and pellets produce the same results by increasing carbon in the system....not much more to say. As to pro-endorsement...Mmm, not really, just expressed my knowledge/workings of the product. <...> The product was not given to me by Tropic Marin, I just wanted an easier means to carbon dose without buying/installing equipment or wasting good Vodka and this became recently available. And yes, you can place in the dailies with Lou's response if you like and I will not send to Neale. I beefed it up a little. Does this look a little better? Really? Does the version I sent you begin with "One of the newer trends"? If so, I find it hard to believe you did not see any improvement. The comparison between other carbon dosing media is there as well as a brief description on carbon dosing. One of the newer trends in lowering dissolved waste in marine aquaria is carbon dosing. Increasing the bacteria by feeding a carbon source increases the population to effectively remove nitrates and phosphates from the water. This is not a magic cure that happens overnight, but can take three to five weeks (depending on the nutrient load) to develop a large enough bacterial colony to effectively consume nitrates. Carbon dosing initially started out with the use of Vodka as a carbon source. Why Vodka you ask? Since Vodka contains no additives and contains only water and the organic compound ethanol, it was determined that this would be much safer to use than other spirits which do contain additives that could have a negative effect in the system. It also proved to be non-economical source as many aquarists have reported large amounts of Vodka disappearing during the night. A safer method soon arrived on the market which is named bio-polymer pellets. I believe the name comes from the ability of carbon to form a wide range of polymeric structures which allows this molecule to form essential molecules found within all organisms. This method of dosing requires a given amount of pellets based on tank size. It also requires the use of an appropriate reactor with pump and flow control valve. The valve is used to adjust water flow through the reactor so the pellets gently tumble and slowly release carbon into the system. Regardless of the carbon dosing media you use, careful monitoring and accurate dosing is required as overdosing can drastically decrease the oxygen level in the water. Overdosing will also cause cloudiness in the water due to an excess of bacteria. This will be the first sign of danger as at this point the oxygen level will begin to drop. Tropic Marin has introduced a new product called REEF ACTIF which basically accomplishes the same function as the above without the need of additional equipment. REEF ACTIF is dosed by mixing the recommended amount with seawater. One half teaspoon is the dose recommended to treat a 60 gallon tank every week. The product is economical to use and a 100ml container should last at least three months for the above size tank. On larger (150+ gallons) systems it may be more economical to use the pellets with a reactor. 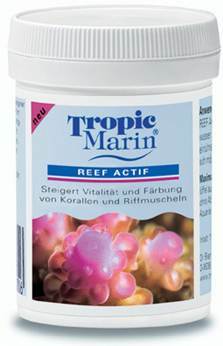 Tropic Marin's REEF ACTIF is advertised to perform a unique dual function role as both an absorber and bacterial nutrient in marine aquariums. It serves as the link between inorganic nutrients and the biological population and works much the same as other carbon dosing sources. REEF ACTIF is a fine powder very similar to the consistency of flour. (Although I have no documented proof, I believe REEF ACTIF is basically finely ground bio-polymer pellets.) When mixed with sea water, REEF ACTIF becomes suspended in the aquarium water where it bonds with both nutrients and other contaminants making them available as nutrients to bacteria and other animals that require dissolved organic material to survive. These bonded nutrients are a source of beneficial bacterial nutrition which strongly promotes the reduction of water contaminants. It is also readily digested by many organisms including clams, corals, and other filter feeding organisms and this will also occur using any carbon dosing media. This amount will treat a 60 gallon tank for one week. I decided to give this product a try since I really did not want to set up a reactor and associated equipment to use bio-polymer pellets. The less to fiddle with the better I like it. Before dosing REEF ACTIF, I performed a nitrate test which resulted in a nitrate level of 20ppm NO3. After approximately thirty days of dosing REEF ACTIF, a nitrate test was performed once again and this test resulted in a nitrate reading of approximately 8-10ppm NO3. Other benefits I noticed were improved water clarity and a more vibrant coloration to the corals and clam stocked in my system. To close, REEF ACTIF performs as advertised and it will surely interest those wishing to lower nitrates by carbon dosing without having to buy the additional equipment needed, or for those lacking space to install a reactor and pump. Well, it is a product review and not an article about carbon dosing. I cannot possibly think of another item to put in there. I did mention alternatives as far as carbon dosing is concerned....Vodka, and the bio-pellets/reactor. That is all stated in the first paragraph. I mentioned nothing about urging people to buy it other than the product works as advertised and produces the same results as the other alternatives. I also mentioned that it may not be economical in larger systems so it's not really pro Reef Actif but my individual thoughts of the product. If you don't want to use it in the CA, that's fine by me and you are welcome to post it in the dailies if you like. I really do not want to do anymore to it. I kind of felt it was pretty nice piece and informative. Have not saw this yet. Thinking about just getting a digital subscription, much cheaper than the pulp and I can always print out an article if I want to archive it. Are you suggesting that the article should be about carbon dosing products in general and make mention (brand name) of what is available along with their pros and cons? Yes, I understand where you are coming from and I do respect your writing skills/experience and suggestions. By writing a survey piece....what are you getting at......something like a poll to see who likes what. I do see where we do not have much on carbon dosing in the way of articles, just FAQs. Maybe I should consider revamping that piece into an article for the site. I hope you are all doing fine, I have a question about Vertex Pro bio pellets, how does this filter media work? Is it worth the high price? I am thinking about adding it to a reactor for my 600 gal FOWLR tank but it seems I would need to buy many bags according their recommendations. I already have a DSB with Chaeto with a single 25 watt fluorescent daylight bulb. I leave it on 14 hrs a day but the Chaeto ball is not growing and itÂ´s been there two months ago, do you think the light is not enough? What kind of light and wattage would be correct in your opinion? You have been most helpful with my previous queries and I was hoping to get your advise on an issue I am facing with my Aquael ReefMax system. A bit of background on the issue - I set up the tank completely stock with a 1 inch sand bed and live rock. The tank is flourishing with all livestock looking and behaving healthy. I knew from early on that the skimmer was the weak link so I have been doing weekly water changes (15%-20%). I was initially using drinking mineral water but have since moved to RO (4-6 TDS). The tank is setup as a reef and stocked as such. Based on my previous queries to you about my stocking, I understand that I am okay on stocking though, if anything, topped out. This is okay since I don't plan to add anything. The issue I have been facing is that I cannot seem to get my nitrates under control. I moved to RO in an attempt to do so but to no avail. As a result, I have green hair algae popping up in the sand. My nitrates rarely read under 70 unless measured the day after a water change. the problem lies with the sponge filter cartridge that the manufacturer recommends be changed every six months. This I assume is a nitrate trap? 1) Keep the filters but replace them much more often. 2) Convert it into a refuge of sorts my adding some macro algae. My concerns here are that if it grows like crazy, it may impede water flow. Also, the area is not well lit so this might not work (would perhaps even have the inverse effect if the algae died?). I could address the lack of lighting quite easily. 3) run it completely empty and use it as my syphon area so I can get the dirt out regularly. I have fine sand so cant really siphon the sand much. Soak the cartridges in old tank water for a while and then return them to their spot. 4) seek chemical intervention in this compartment. Have done a lot of reading but to be honest I am confused and skeptical about the options (Bio-Pellets or Seachem Denitrate etc.). What has me even more confused is that my phosphate readings are nowhere near as bad. Typical reading is 0.2. Have seen it at 0.5 but not since I moved to RO and revised my feeding of frozen foods. - I feed a mix of mysis, brine and Cyclops once every day. Each cube lasts me almost 3 weeks. I dice the cube into daily helpings while still frozen and put it in individual containers that remain frozen until they are to be used. In addition, I feed the Perculas around 3 dry pellets every morning. Would really appreciate your thoughts on what I should do about the sponge filters and what else I might not have thought of to help control the nitrates. As always, thanks for entertaining queries. It is incredibly encouraging to know one has a place to go when stumped. Thanks for the quick response. I currently have 2 Perculas, a purple firefish and a clown goby. Also have a cleaner shrimp and fire shrimp and 3 turbo snails. The Perculas are tiny and one will move to my new 65 gallon in 3 weeks. The food is consumed almost instantly (2 minutes tops). All the coral I have is photosynthetic. From your advice below, it seems like getting rid of the filters completely may be worth a try. I will remove 2 per week so in 2 weeks they are all gone. I have over 25 pounds of rock in the system and am happy to add more if you think it is needed. I wonder what the manufacturer's rationale for these pads was. Should have used the space for a better skimmer perhaps. In regards to Simon's statement below. "Have done a lot of reading but to be honest I am confused and skeptical about the options (Bio-Pellets or Seachem Denitrate etc.). <These are just band-aids, won't really help solve the problem.>"
can take three to five weeks (depending on the nutrient load) to develop a large enough bacterial colony to effectively do the job.....but it does work. Just my two cents Amigo. Let's ask him to elaborate. One's Band-Aid may be a lifesaver to another. Is this a statement that you think came from me? Is there another Simon in the crew? I did not make this statement, I am fully aware of how carbon dosing, be it vodka or pellets works... it is related to the 'Redfield ratio' that was originally described for plankton... ie a take up ratio of C:N:P 106:16:1. So by dosing 106 parts carbon you will encourage bacterial growth that reduces nitrogen (nitrate) by 16 parts and phosphorous (PO4) by 1 part. This is my view on the subject not the one stated below. Accept my apology. Why I thought Simon wrote this is beyond me. Was actually Chris that answered this query. Sheesh! Your very gracious apology accepted James, no hard feelings! Yes it was me causing problems again. I am not opposed to carbon dosing through the addition of alcohol or some other method, although around my house there is rarely spare vodka for the fish. It's just that in a small FOWLR tank there is little need to feed heavily like a coral heavy or heavily stocked tank thus creating higher nitrates. Plus I hesitate to recommend carbon dosing to someone who's experience level I don't feel is very high, next thing you know they are doing shots with the clownfish, and if you have ever experienced a Premnas biaculeatus after a tequila bender you never want to do that again. While Bio-Pellets and Denitrate are better and safer alternatives in my opinion, in this particular case unnecessary where a little better husbandry would probably do the trick. Anyways, just my 2 cents, and if you think I'm wrong then just continue to blame Simon for the response. In an unrelated note, James did you finish the LED review, I was at a local shop yesterday looking at a couple of systems, but the kid working there couldn't give me any relevant information other that "they don't get hot or use much electricity". He said testing it with a PAR meter was too expensive so I have nothing to go on there. And in a note unrelated to the previous unrelated note, Bob I think I found a new WWM crew recruit, I'll put you in touch with him shortly, he has several nice tanks and seems to know what he is talking about. He was also interested in writing articles for the mag, so that could be helpful. Just my 'two penneth worth' also... I would agree with Chris and hesitate myself to recommend carbon dosing to reduce nutrients (although it is a valid method of doing so) until all other more traditional avenues had been explored, and especially to inexperienced aquarists... there is always the danger that with the advent of low nutrient systems due to these methods, the casual or inexperienced or UN-conscientious aquarists (of which there are many) are encouraged to overstock their systems with inappropriate fishes. You can continue to blame me if you like, I am married and quite used to it, and also guilty so never mind! I can agree with you somewhat Simon, but if an aquarist has a serious nitrate problem, this is likely the best and safest way to lower it, although it can take a few weeks. Poor husbandry is another matter to deal with. Third time writing in! Contacted you last time about an algae problem which has since been cured. Thanks for the help! My current issue is with a slightly hazy (cloudy) tank. I'm had problems with low alkalinity and high calcium in the past, but pH was fine. I was correcting the problem by adding baking soda. Everything was just fine for awhile. About 1.5 months ago I got some new baking soda from a friend and added it to the tank as per usual. The next day, the tank was quite cloudy/hazy. I assumed I had overdosed and let the tank take care of itself for a few days. Nothing changed...perhaps slightly less cloudy, but still hazy. I read that it should clear-up by itself and there might be a snowstorm and precipitate on the rocks etc. So far, I've had no precipitate at all. I also have some brown hair algae growing in the tank recently, since fixing my last algae problem (red slime). Don't think its related. but Alk quickly went low again; this was before water changes. After doing these water changes calcium has climbed, but Alk is low still. Ph is fine ... but my magnesium is very high. Before starting water changes it was at 1,500ppm, its now at 1,650ppm. I am not adding anything to my tank right now except 2ml vodka a day (tank volume 110g). I'm using the same salt mix I've always used (marinium), so not sure what's going on here. I can't find much info on high magnesium levels, but I'm guessing this, alkalinity and calcium are all doing something strange here. <I just wrote a short article on magnesium which Bob recently placed on our site. Do read here. I've also lost about 3 snails, 3 crabs, a cleaner shrimp and a blenny since the cloudiness. Before this, lost almost nothing in the past 6 months except the occasional hermit crab from fighting. Only one coral and its not too happy at the moment. All the fish seem to have Ich suddenly as well, with no new pet introductions. I also found a pump leaking about 100v of electricity into the tank, this was rectified yesterday. Tank still hazy, any ideas would be very much appreciated! Thanks! Hope all is going well, or at least better than it is for me at the moment. I try to keep this as short as possible. I have a 200g reef system full of softies Â­ Kenya tree, and a huge Medusa coral ( sorry I donÂ¹t know scientific names) all were doing great. Really great Â­ medusa coral was well over 2' high and wide and was my showpiece moving back and forth with the Wavemaker. My nitrates were at around 20, so I thought id try RedSea P04 reducer to reduce my water changes . I was using it in my auto top up for about a month Â­ took a holiday to Canada saw the great success and high stocking levels there with SPS corals and quarterly water changes and thought id try some of that. They were using NP biopellets in a reactor, so as soon as I got home I tried the same. But something went wrong. I thought as the biopellets are "solid vodka"
feeding the bacteria that reduce nitrates, switching from liquid dosing would not be a problem as its the same bacteriaÂ. So I plugged in the reactor with about quarter of the recommended dosage. All was fine for about a day until the auto top off added more of the RedSea product. I didnÂ¹t think this would be a problem as I had already heavily diluted the top up water. What a mistake. through it away incase it affects my Kenya trees. But after growing it soo big I would like to salvage it as lots of small pieces if possible Â­ if they survive I know they will grow huge again. My question is, should I restart adding the P04? My thinking is that the RedSea bacteria may outcompete the strain thatÂ¹s in there now? I am cautious because as the mix of the two products seemed to have reacted badly but I've also heard your not supposed to just stop the RedSea P04 reducer. Was this because the biopellets needed to be cycled in some way first? Although it does not say this in its instructions. I would still like to use the biopellets in the future as its a more natural/constant supply of bacteria that cannot be overdosed. The reactor is presently running on an unoccupied tank. Just too let you know the second dip I done was with a product called" coral rx pro " and it seems to have worked - amazing. I will definitely use this stuff in the future to pre-dip my corals.